This genealogy database was started in 1995 as part of my search for Robert Paul Herndon—my paternal grandfather who disappeared in 1937. In 2002, I found his gravesite in Blytheville, Arkansas, ending that part of the work but continued my research completing significant portions of the Herndon, Masten, Stiles, Tutein, Fairbanks, Lindell, Johnson, Bonnell, and Jarvis family trees. This is all a round-about way of saying that I have spent thousands of hours and thousands of dollars building a database that is unlike 9 in every 10 genealogy compilations you will find on the Internet. There is no fact in my database that does not have supporting evidence, no person nor family that does not have citations. So I ask that you please respect the work I've put in by abiding by the restrictions of the Creative Commons Attribution-NonCommercial-ShareAlike license. In fact... I insist! 20 May 2018 - Completed an upgrade to TNG 12 and have finished updating all of my mods and templates. 16 Apr 2017 - I've started uploading all of my 1400+ source files and linking them to their TNG source entries. Check out What's New to see some examples. 15 Nov 2016 - You can now view Lindell-Herndon Genealogy in Danish, English, French, German, Spanish, and Swedish, all the languages of our ancestors. 24 Mar 2016 — All the mods and templates I've designed have been tested or updated for TNG 11. 17 Jul 2015 — NearDark and NearDawn, the TNG templates that I use for this site, have been published to the TNG community. 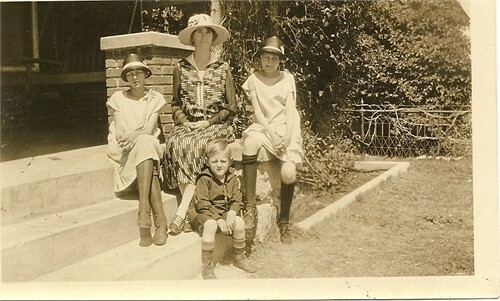 23 Nov 2014 — I've begun publishing a few of the more significant photos from my great-grandmother's album. 10 Nov 2014 — I've inherited two family heirlooms: A original edition of The Lone Star State series from 1893 and my great-grandmother's personal family photo album. 26 Aug 2014 — Upgraded to TNG v10. 17 Dec 2013 — In light of Ancestry's acquisition of Find A Grave, I have removed all the gravesite photos of the memorials I manage. Most photos are still available via my Flickr account. 4 Aug 2012 — My father's only brother, Robert Frank Herndon, passes away at the age of 77. 1 Apr 2012 — My database goes live using TNG and a modification of template 8 I call Near Dark. 23 Mar 2012 — Using The Next Generation (TNG) for the first time. 20 Oct 2011 — My father, William Cecil Herndon, passes away at the age of 79. Mar 2002 — I locate my grandfather's gravesite in Blytheville, Arkansas. Jan 1998 — Begin publishing at Rootsweb.com. May 1997 — Web-publish my database for the first time using Gendex. Feb 1997 — Begin using Reunion for Macintosh for my data. Dec 1995 — I start the search for my paternal grandfather.